Kids are like sponges, soaking up everything they hear, see, smell, and taste. Babies begin to learn eating patterns before they are even born, and continue to discover new patterns and habits throughout childhood. As parents and caregivers, you have the greatest impression on these habits. A healthy diet and good childhood nutrition can reduce the risk of certain diseases and improve quality of life for both you and your baby. Try these 5 simple tips to raising a happy, healthy eater from birth. Breastfeeding is practical, cheap, and one of the healthiest choices for your little one. Breast milk provides protection for the immune system and contains all of the vitamins and nutrients needed to help your baby grow until 6 months of age. The World Health Organization recommends exclusive breastfeeding for the first 6 months, and in combination with complementary foods until 12 months or older. Research shows that infants who are breastfed for at least 3 months eat more fruits and vegetables when introduced to complementary foods, and these healthy eating habits tend to continue through preschool and childhood. Need some breastfeeding support? Ask your doctor for breastfeeding support resources and referrals. Many ready-to-eat commercial baby foods have added preservatives and sugars that make them less healthy. Before you purchase store-bought baby food, read the ingredient label and make sure the list contains real foods, no preservatives, and no added sugars. Or, try making homemade baby food. All you need is a blender! Making your baby’s food at home allows you to experiment with fun foods not available in commercial form, like tomatoes and avocadoes. Check out these 3 tasty baby food recipes to get you started: Pasta and Kale, Quinoa, Chicken and Vegetables and Sweet Potato Broccoli and Grains. Remember: Practice food safety to keep your baby healthy. Before making baby foods at home, check out https://www.foodsafety.gov/ for some important baby food safety tips. Little bodies need small portions of food. Toddlers tend to eat around 6 small meals a day, rather than 3 large meals. Cutting foods into easy-to-grab sticks or cubes helps your child become an independent eater. 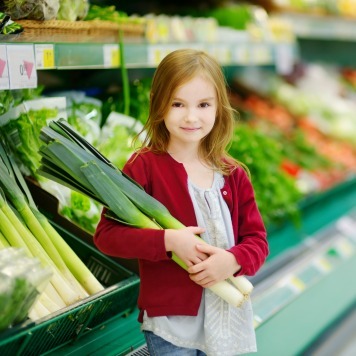 Kids can easily pick up these foods, safely chew, and avoid choking. Research suggests that children using adult-sized plates tend to serve themselves larger portion sizes and as a result, they tend to eat more calories per meal. Use age-appropriate plates, bowls, cups, and utensils to encourage proper portion sizes. Variety is the spice of life. Trying different flavors, textures, and tastes in the first 2 years of life helps children learn eating skills and increases their willingness to try new foods. Note that babies and toddlers may need to be introduced to a new food up to 15 times before they recognize the food and accept the flavor. Have patience, offer the same food different ways, and never force kids to eat something they do not like. Also, remember to be a good role model. If you are not eating your fruits and vegetables, do not expect your child to. “Sam, would you like peaches or pears with your lunch?” Offering your toddler or child choices between various healthy options encourages eating more fruits and vegetables, and promotes a sense of independence that children love. A healthy eating environment is important for the development of good eating habits. Separate mealtime from playtime by avoiding distractions at the table like toys, electronic devices, and television. Studies show that children who watch television while eating dinner consume less fruits and vegetables with meals, and they continue eating even when not hungry. 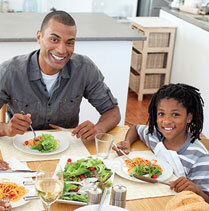 Sit together at the table and create your own family mealtime rituals. Maybe you light a few candles to set the mood, or you always keep a pitcher of lemon cucumber water on the table. As kids get older, they can participate in the mealtime conversation, help set the table, and even prepare some of the food. It may take as many as ______ times of being introduced to a new food before a baby will accept the flavor. For how long does the World Health Organization (WHO) recommended exclusive breastfeeding? True or False? Toddlers and adults need the same size servings for meals and toddlers should eat off adult-size plates. 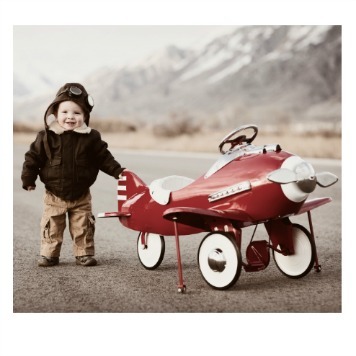 Healthy Traveling with Kids: It’s Possible! Amber Cottrell is a recent graduate from the University of Cincinnati and plans to pursue a career in pediatric nutrition with a focus on school nutrition. She believes that nutritious eating should be a central part of any lifestyle, as it enables people to be happy, healthy, and productive. She lives with her husband in Kentucky where she enjoys cooking, gardening, and exploring the great outdoors.